When traveling in Laos and visiting temples, homes and businesses, you'll sometimes see these spirit houses setup up outside. They're usually made from carved wood, plaster, or cement. 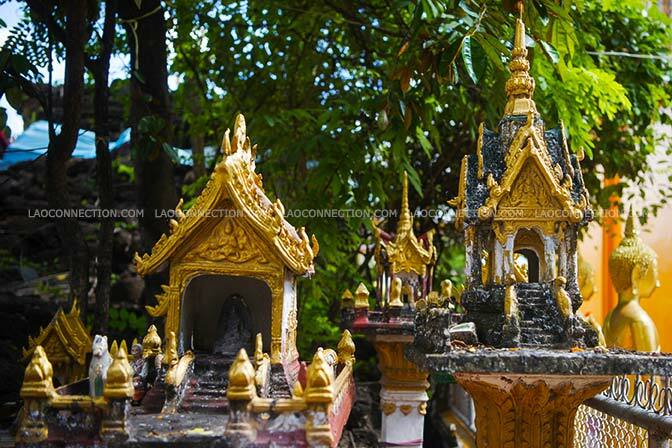 And they're often depicted as traditional Lao style homes or, as shown in this picture above, as small versions of temples. Why have a spirit house? Locals say that it's meant to house any nearby spirits where the dwelling exists. So there could be a spirit of the land or the home in the area. What's more, is that people will also give symbolic offerings of flowers, sticky rice, water, and candles. They do this during Lao celebrations or to commemorate a loved one who has passed away or more generally for any wandering spirits. This practice is not a Buddhist tradition in origin but rather an animist one.